We've turned the corner into fall, which means we have mostly exited the outdoor festival season in Portland. That doesn't mean there aren't any outdoor events, but most of what's coming up is small compared to summer. 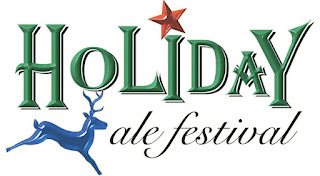 The exception, of course, is the Holiday Ale Festival. I was temped to wait a few weeks to talk about the HAF, which doesn't happen until the end of November. However, the venue and the growing popularity of the event mean now is a good time to start thinking about your plans for the festival. 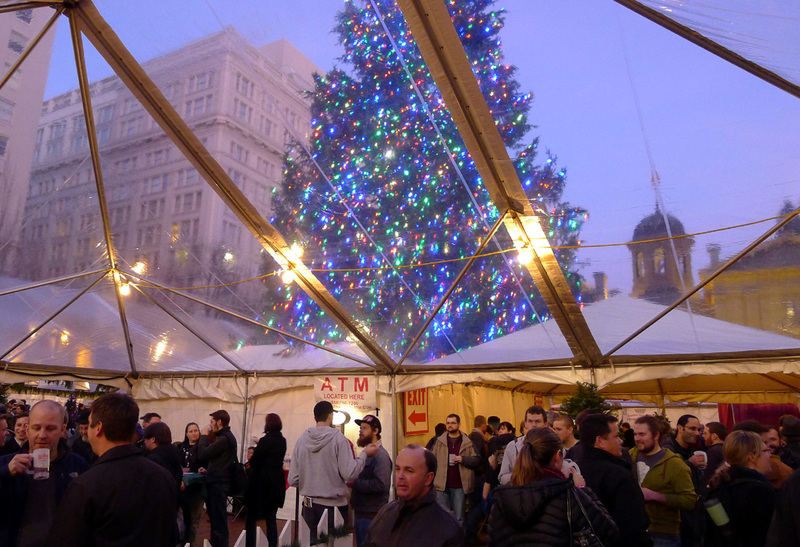 This is the 17th year for the Holiday Ale Festival, on tap Nov. 28 through Dec. 2 at Pioneer Courthouse Square in downtown Portland. No need to be thinking about the beer list at this point. I'll post a list of target beers closer to the actual event, as will others. Just know that organizer Preston Weesner always features a lot of unique, typically big beers at this festival. This year isn't going to be any different. Trust me. The size of the venue is the reason you should plan your trip times carefully. They expect around 17,000 people to visit the festival during its Wednesday-through-Sunday run (check the event website for times). Even though this is an outdoor festival, it's held underneath clear, heated tents. You don't have to worry about getting cold, but it can get a little cramped. Festival organizers gave out clear attendance advice in the press release announcing the event: "The recommended days of attendance are Wednesday, Thursday and Sunday." There's a cryptic message here, and the message is Friday and Saturday are going to be jammed. A word to the wise. In my mind, the HAF is one of the best events on the Portland beer calendar. The beer list is generally spectacular and a venue that was once dark and dingy has been transformed by the arrival of clear tents. 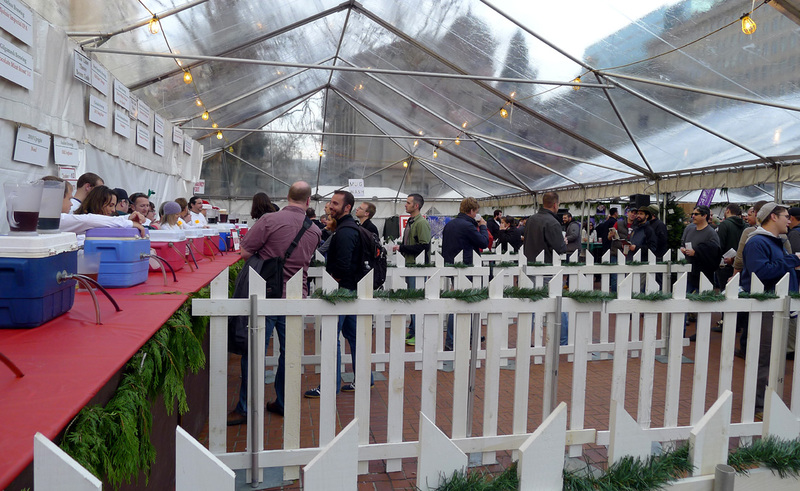 Hanging out under these tents while sampling great beers is a fine experience for beer fans. If you take some time to mingle, you'll likely meet folks who've come from out of town and out of state to attend the festival. That's the power of a great beer event. Like all the other festivals, there's a cost associated with the HAF. They make it fairly simple by selling you a $30 package that includes a festival mug and 10 tasting tickets (no wooden tokens here) at the door. If you want a slightly better deal, go to the event website and purchase a package in advance. The price is the same, but you get 12 tickets instead of 10. Additional tickets once you're inside are $1. Remember, some (perhaps many) of these beers will require double tickets for a taste. A word about pricing. The cost of attending this festival has risen steadily in recently years. Last year, the base package cost $25 and included a mug and 8 tickets. So you were essentially paying $17 for the mug. This year you're paying $20 for a mug if you buy a package at the door. Few connected to the beer community are going to openly say so, but I think the price is a bit excessive. There are all kinds of arguments for why they have to charge more for this festival. They have to pay for the venue, the tents, the lighting, scaffolding and they've got to heat the tents. Plus, these beers cost more. Look...if you have to charge double or triple tickets for rare beers, fine. It makes sense. But charging $20 for a plastic mug strikes me as being over-the-top. Of course, it doesn't matter what I think. Even though there will be some bitching about cost, the event will be packed every day. Organizers have found that increasing the price has virtually no negative effect on attendance...which they wouldn't mind limiting, anyway. So the cost continues to escalate. This thinking may eventually catch up with them, but it hasn't yet. 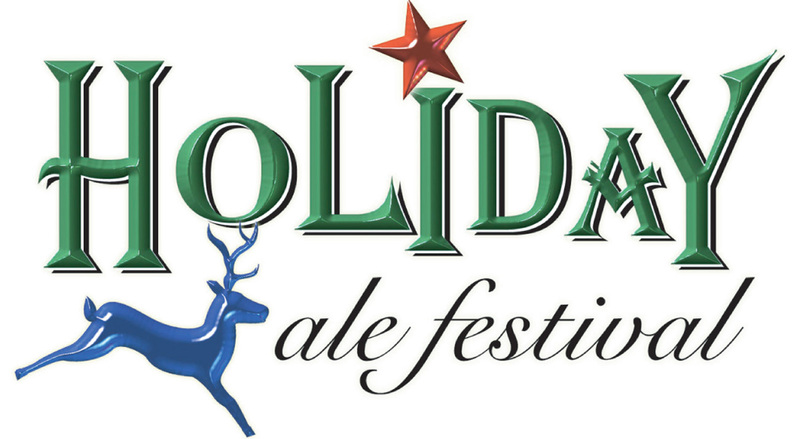 One final thing to consider is the Holiday Ale Festival is a 21-and-over event. If you show up with the kids, you'll have to lock them in the car because they won't be allowed under the tents. I'm kidding about locking the kids in the car...and, frankly, I hope you aren't driving at all if you're tasting these big beers. A better plan would be to take MAX (which has stops right next to Pioneer Courthouse Square), the bus or get a designated driver. I appreciate your open and honest opinion about the cost, and I agree with you. That being said, I'll still go but I would be much, much more interested in going if they would limit attendance. That's one of my biggest gripes with Oregon festivals. There's no doubt in my mind that the cost is designed to reduce attendance somewhat. The Holiday has a bigger problem than the other notable festivals due to the (small) size of the venue. 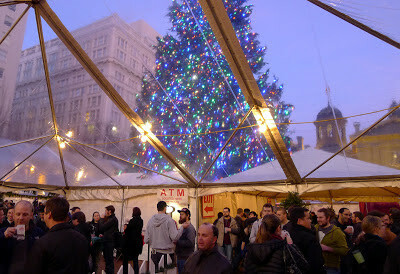 I'd like to see drinking sessions at the larger Portland festivals...something like what they do at GABF. There's resistance to that approach at the moment, but I think it will eventually happen. We may even be alive to see it. I am curious why you are sure rising cost is to reduce attendance. I think you make a good suggestion to go the session route like GABF does and if you wanted to limit attendance than that would be a sure fire way to do so. I was recently talking about the way GABF does it with sessions and how Elysian just adopted that for their recent Great Pumpkin Fest. I work on a lot of fests that do presale tickets and generally despite best efforts Portlanders especially dont buy advanced tickets or atleast in not enough numbers to sellout a large festival. I think presale is an excellent way to go but you really need an event that has so much demand you do not worry about attendance and Holiday Ale Fest probably is such an event. My comments on the attendance issue are based on things I've heard certain people say, not anything anyone connected to the HAF has said (or would say) publicly. I agree with you: If there's an event in Portland where the presale concept would work, this is it. I think people would be willing to pay high dollar for a ticket to a drinking session in which they knew the venue wouldn't be packed to the gills and they would have easy access to the beers. This approach obviously has the best chance of being a success only with a popular event like this one. I suppose the way to test the theory would be to try it for a day or part of a day and see what happens. They could expand it from there if it worked out. Anyway, thanks for reading and commenting.